Brother Besson is our Director. He was encouraged by God, his friends of the Canadian League of Rights, and dire political circumstances, to start doing something to awaken the people of Winnipeg about what was going on behind the scenes politically. So in January 1980, Mrs. Julie Manders and Cliff Besson, both of Winnipeg, started the Freedom Canada weekly community television program. After some years the name was changed to Truth and Light and Mrs. Manders and her husband Sid moved to British Columbia. Cliff then carried on the program alone but by 1986, with the help of other friends, the Truth and Light program developed into Truth and Light Ministries Inc. The above picture was taken about January or February 2011. For about nineteen years, Cliff worked as a missionary amongst the natives in north-western Ontario at a number of Indian Reservations (I. R.) or First Nations and in native churches in places like Sioux Lookout, Balmertown, Savant Lake, Sandy Lake (I. R.), Whitefish Bay (I. R.), New Osnaburgh (I. R.), and one or more other places. At times, Cliff has worked at the Lighthouse Mission in Winnipeg, gone door to door, given out Gospel tracts, prayed for the sick, distributed food and other needed items to the poor, and lately, been working on some writing projects. He also has been ministering amongst the Metis and natives in the Camperville-Pine Creek First Nations area, especially at the First Apostolic Church in Camperville, Manitoba that was started by Pastor John Bone more than thirty years ago. Rev. Janzen is our Assistant Director who helped brother Cliff Besson keep the ministry going when he and brother Fred McClellan moved to Ethelbert, Manitoba. 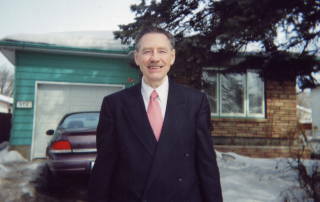 Cliff had been helping brother Janzen with his Interdenominational Revival Program Inc. (IRP Inc.) for about twenty years as their treasurer and park ministry director at Memorial Park, Winnipeg, while brother Janzen went over seas as a missionary to Africa, India, Pakistan, Cuba, and the Philippines. Through his Gospel tract ministry, his evangelistic crusades, his training of converts and pastors, and his efforts at starting new churches, there are now possibly twenty churches that were started over seas, either directly or indirectly through his ministry for God and the Kingdom of Jesus Christ. Brother Janzen, used to sing and play his accordion at the Lighthouse Mission in Winnipeg, Manitoba and at some churches in Winnipeg. He lived for some time at a Personal Care Home on Molson Road, Winnipeg, Manitoba. Brother Janzen, who was born in Osterwick, Ukraine on February 15,1932, passed away at age 85 on December 21, 2017. Brother Fred had been going to church since he had been a child, ever since someone started to bring him to a Sunday School at a United Church in Galt, Ontario. He started to read the Bible when he was about ten years old and had been reading and studying ever since. 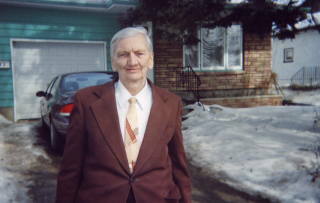 Fred went on to be with his Lord and Saviour Christ Jesus on 30 January 2011 at 6:20 p. m. at 94 years old. In May or June of 2005 he came down with prostrate cancer. After spending nearly three weeks in hospitals (Dauphin and Brandon), Fred was sent home to die but in answer to prayer, God had Henry Klassen of Boissevain Manitoba give Cliff Besson, his partner, a super diet against cancer and tumors. This diet checked the flow of blood and gradually killed the cancer cells while he followed the diet. Mainly because of this diet, Fred was doing great. His doctor was quite surprised that he was doing so good, especially at his age.of 88 to about 92. For more information on this diet and for special recipes in order to stay cancer free, see our Health page for information on obtaining the book and diet plan of Colonel Joe Hart. Brother Fred had been helping Cliff with his ministry in Ethelbert, in Camperville, and at Garland, Manitoba. He was one of our good prayer warriors and gospel tract distributors. God only knows how many have come to know Jesus through the hundreds of gospel tracts that he distributed in Dauphin, Ethelbert, and other towns and cities in Canada. Mr. David Jonathon Thomson, Doctor of Veternary Medicine, Retired. Brother Dave is quite a kind and generous Christian and is well liked by many. He regulary attends church is his area of McCreary, Manitoba. Mr. Lawrence J. Arsenault, who is presently blind because of a work injury. He is completely blind in one eye with about ten percent vision if the other. He has a hobby of building beautiful furniture out of solid oak and maple wood. Though he is mostly blind, one would generally not believe he is though, because of the beautiful works of furniture he has made and would like to sell. We will try to post some pictures of his handiwork later on. Lawrence lives in Winnipeg at a residence for handicapped people. Photos of Clifford Besson and Rev.Wilhelm Janzen at his former residence in Winnipeg. on April 29, 2006. 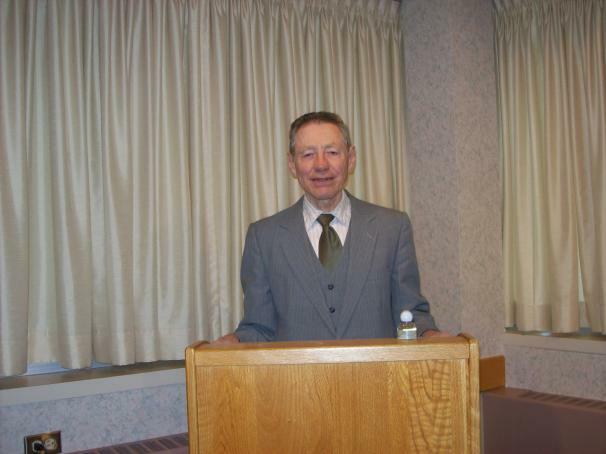 Below is Clifford Besson at Chapel at Dauphin Hospital in 2011 or 2012. 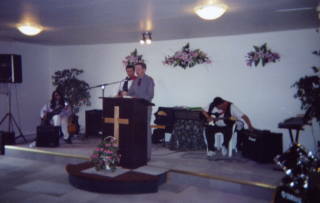 Cliff Besson ministering in a Metis Apostolic church of Senior Pastor Gertie Bone (deceased Sept. 29, 2007) and Assistant Pastor Lorne Bone (wife Alice Susan Bone) in Camperville, Manitoba. Church founded in 1968 by Pastor John Bone (deceased). 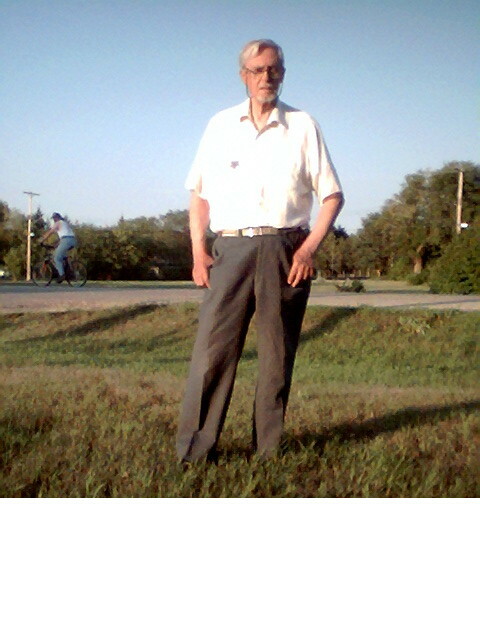 Below is Frederick McClellan on his 90th birthday on 7 August 2006 in Ethelbert, Manitoba. Fred passed away 30 Jan. 2011 at 94.